[291 Pages] Industry 4.0, increasing use of industrial automation in manufacturing, government investments supporting industrial automation, rising emphasis on regulatory compliances, increased complexities in supply chain, and increasing demand for software systems that reduce time and cost are the key factors driving the growth of the smart manufacturing market. The smart manufacturing market was valued at USD 153.25 billion in 2017 and is expected to reach USD 299.19 billion by 2023, at a CAGR of 11.9% from 2018 to 2023. The base year considered for the study is 2017 and the forecast period is from 2018 to 2023. The report provides detailed information regarding the major factors influencing the growth of the smart manufacturing market. Amidst sluggish economic growth, increasing productivity and lowering manufacturing costs have become quite critical for manufacturers all over the world. On account of this, manufacturing companies are witnessing intense competition, and this trend is expected to continue during the forecast period. To better optimize resources and reduce costs, manufacturers are actively focusing on adopting industrial automation and enabling technologies. Enterprise manufacturing intelligence (EMI) system analyzes manufacturing data collected from various sources across an organization. This information is then utilized to track performance against relevant metrics. Integration of advanced HMI solutions and connectivity technology with various industrial automation equipment has tremendously increased quality, productivity, and mobility of plant assets. Adoption of industrial automation equipment, such as industrial robots, field devices, and smart equipment, has increased significantly among manufacturers from various industries such as food & beverages, oil & gas, metal & mining, automotive, semiconductor & electronics, and aerospace & defense. Integration of solutions such as ERP, SCADA, PLM, and PLC with MES enhances efficiency of processing and gives effective output. Manufacturing execution system (MES) is capable of performing multiple activities and delivers efficiency by checking quality as well as production optimization. It tracks processes and procedures with the help of industrial automation. MES helps optimize production costs by reducing wastes, downtime, rework, and defects during manufacturing. The popularity of cloud-based solutions is increasing rapidly as they help manufactures operate modern and advanced software without any need for separate om-premise infrastructure. Implementation of PAM software is a complex process as manufacturers deal with various production as well as automation assets that interact with each other. Cloud-based deployment offers manufacturers centralized process execution and coordination advantages in a cost-efficient package. A cloud-based WMS allows warehouse operators to track inventory more easily and ensure that necessary stock is available to fulfill customer orders. If there is any unpredicted demand for certain products, cloud computing makes it easier to respond quickly by enabling communicating with suppliers and staff to get the required stock. This research study involves the use of secondary sources, such as encyclopedias, directories, and databases (OneSource and Factiva), to identify and collect information useful for the extensive technical, market-oriented, and commercial study of the smart manufacturing market. Primary sources such as experts from related industries and suppliers have been interviewed to obtain and verify critical information, as well as assess prospects. Key players in the smart manufacturing market have been identified through secondary research, and their market rankings have been determined through primary and secondary research. This research includes the study of annual reports of top market players and interviews with key opinion leaders, such as CEOs, directors, and marketing personnel. The following figure shows the breakdown of primaries based on company type, designation, and region. As of 2017, 3D Systems (US), ABB (Switzerland), Cisco (US), Cognex (US), Daifuku (Japan), Emerson (US), GE (US), Honeywell (US), IBM (US), JBT (US), Keyence (Japan), NVIDIA (US), Oracle (US), Rockwell (US), SAP (Germany), Schneider (France), Siemens (Germany), Stratasys (US), Universal Robots A/S (Denmark), and Yokogawa (Japan) were the major players in the smart manufacturing market. Other players in the smart manufacturing market include Samsung (South Korea), Sony (Japan), Google (US), Intel (US), and PTC (US). • How do enabling technology developers position themselves in this competitive market? • Which major industries adopt the maximum number of information and enabling technologies? • What are the growth prospects of this market in different regions? This research report categorizes the smart manufacturing market based on information technology, enabling technology, industry, and geography. Smart manufacturing is a powerful disruptive force with the potential to restructure the current competitive landscape and produce a new set of market leaders. It is a combination of various technologies and solutions, which, if implemented in a manufacturing ecosystem, is termed smart manufacturing. 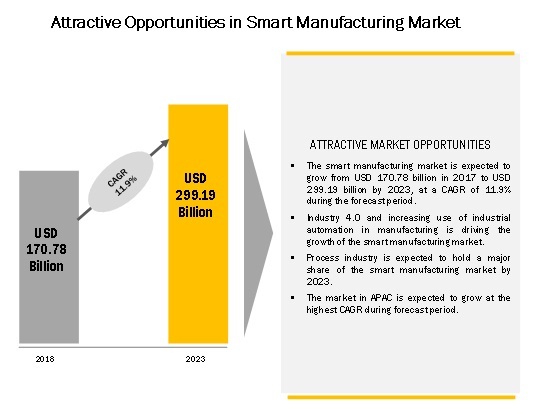 The smart manufacturing market is expected to be worth USD 170.78 billion by 2018 and USD 299.19 billion by 2023, growing at a CAGR of 11.9% from 2018 to 2023. Factors that drive the growth of the market include Industry 4.0, increasing use of industrial automation in manufacturing, government investments supporting industrial automation, rising emphasis on regulatory compliances, increased complexities in supply chain, and increasing demand for software systems that reduce time and cost. IIoT is expected to hold the largest share of the smart manufacturing market for enabling technology. Various technologies are using IIoT to improve the functioning of the process. These technologies comprise of sensors, RFID, industrial robotics, distributed control system, condition monitoring, smart meter, electronic shelf label, camera, smart beacon, interface board, yield monitor, guidance and steering, GPS/GNSS, flow and application control device, and networking technology. Use of IIoT in these technologies helps to analyze the data collected via various devices and enables effective decision making. Industrial communications is expected to hold the largest share of the smart manufacturing market for information technology. Industrial communications is a combination of components, software, and standard protocols that allows man-to-machine and machine-to-machine communication across various industries. Efficient, reliable, and secure industrial communications help in improving operational efficiency and reducing overall operational costs of organizations. Industrial communications plays a significant role in industries such as oil & gas, electronics, automotive, and energy & power. The market for the pharmaceuticals industry is expected to grow at the highest CAGR amongst process industries from 2018 to 2023. As pharmaceuticals manufacturing is a complex process, it requires proper end-to-end monitoring to achieve operational efficiency. Manufacturers face problems such as growing cost pressures, regulatory and safety guidelines, and increasing demand for diverse product portfolios. Technologies such as MES, EMI and HMI help manufacturers standardize their workflow and minimize lead times by eliminating the time required for the approval from various bodies such as FDA. 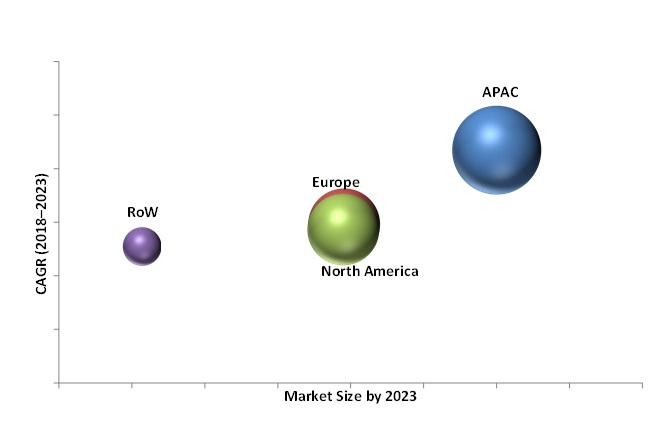 The market for the automotive industry is expected to grow at the highest CAGR amongst discrete industries from 2018 to 2023. 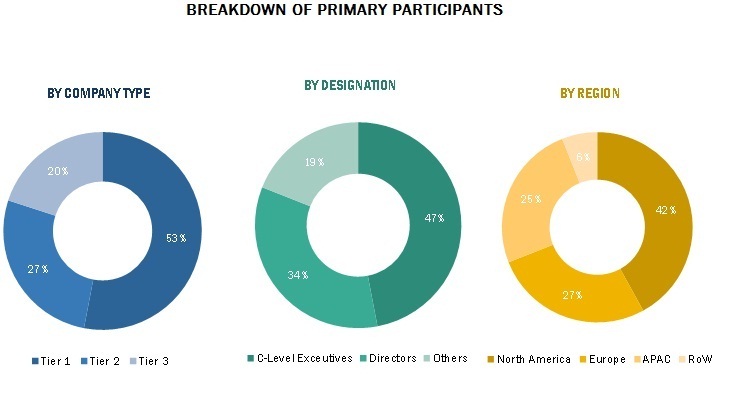 Increasing demand for automobiles in developing countries; technological innovations, such as electric cars, fuel efficient cars, connected cars; and growing competition in the market are expected to drive the demand for smart manufacturing in the automotive industry. Installing robots has helped several automotive companies to offset the shortage and high costs of acquiring and retaining skilled labor. This trend is expected to continue as sustainability, high productivity, and energy-saving measures are becoming important. The smart manufacturing market in APAC is expected to grow at the highest CAGR globally from 2018 to 2023. The economy in the APAC region is world’s one of the fastest evolving due to increased spending on improving performance, security, and economic stability. The region is witnessing a surge in the deployment of smart manufacturing technologies. China, being one of the top manufacturing countries, has been adopting enabling technologies to increase operational efficiency and production in the country. Due to increasing maintenance costs in manufacturing, manufacturing and energy & utilities industries have been genuinely considering the adoption of advanced technologies, such as predictive maintenance, to optimize maintenance processes and reduce operational costs. Major factors restraining the growth of the smart manufacturing market include high investment and cost involved in implementation, lack of standardization among equipment manufacturers and in connectivity protocols, constant need for upgrading software, and low adoption of technologies owing to technical issues. 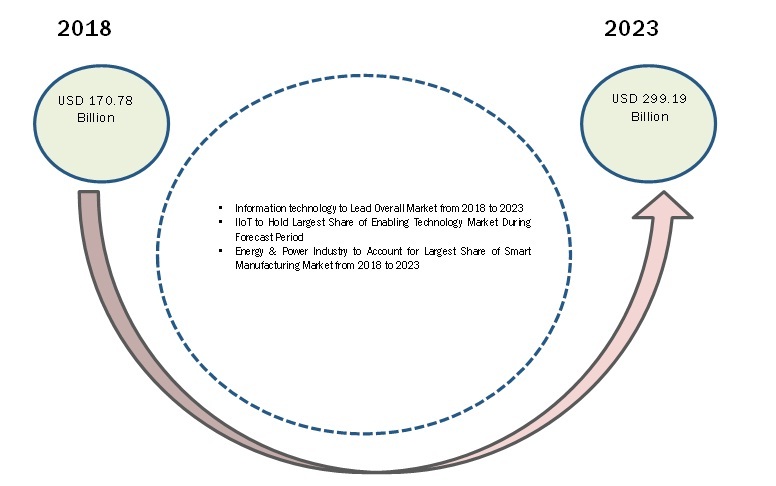 Key market players such as 3D Systems (US), ABB (Switzerland), Cisco (US), Daifuku (Japan), Emerson (US), General Electric (US), Honeywell (US), IBM (US), Oracle (US), Rockwell (US), SAP (Germany), Schneider (France), Siemens (Germany), and Yokogawa (Japan) have adopted strategies such as product launches and developments, expansions, acquisitions, agreements, contracts, collaborations, and partnerships to gain competitive edge in the smart manufacturing market and expand their distribution networks. Industrial 3D printing is used in various applications such as tooling, robotics, and special machinery. Robotics forms an important part of industries such as automotive, aerospace & defense, food & beverages, printed electronics, and foundry and forging. Combining industrial 3D printing with robotics allows creating well-designed, lightweight, and less expensive components. Industrial 3D printing simplifies the expensive and time-consuming process of manufacturing tools, eliminating assembly lines and thereby, reducing labor costs as well. Industrial 3D printing is also used for developing special machinery such as heavy equipment and machinery components; it also allows for customizations according to customer needs. The special machinery also includes high-quality metal and plastic parts of highly complex designs. Collaborative robots, or co-bots, are robots that are designed to work alongside humans in a workspace to provide enhanced process efficiency. These robots are different from industrial robots in a number of ways, such as the absence of “safety fence” while working alongside humans, simplified programming and reduced setup time, integration of auto-speed reduction and distance monitoring via proximity sensors, and ability to reduce motor power and force during application to avoid harm to a human coworker. Collaborative robots are used to perform autonomous or semiautonomous tasks for a variety of applications such as assembly, pick and place, handling, packaging and palletizing, quality testing, machine tending, gluing and welding, lab analysis, painting and polishing, screw driving, and injection molding. Machine condition monitoring is the process of determining operational state and condition of a machine for detecting potential breakdowns with the help of automation. The process comprises periodical or continuous data collection, analyses, interpretation, and diagnoses. This approach is different from traditional methods wherein processes are manual. Machine condition monitoring optimizes equipment readiness and reduce maintenance and staffing requirements. It is used to prevent unscheduled outages, reduce downtime and maintenance cost, and optimize machine performance. This technique is primarily classified into preventive machine monitoring and predictive machine monitoring. Predictive monitoring allows companies to detect potential trouble, diagnose problems, and choose remedial actions before performance degrades or downtime occurs. Preventive monitoring, on the other hand, is performed while an equipment is in normal condition to avoid unexpected breakdowns and the associated downtime and costs. Will suppliers continue to explore new avenues for smart manufacturing technologies? What are the adjacencies that the companies can leverage or explore?